Ignorant of the theory of evolution, Bible Life Ministries goes on to claim that all fossils doesn’t represent intermediates; those that do are frauds. Funny how creationists would refuse to consider all those verified fossils and instead claim that the Paluxy River footprints are proof of creation. Without wasting time, let’s take a look at their claims. 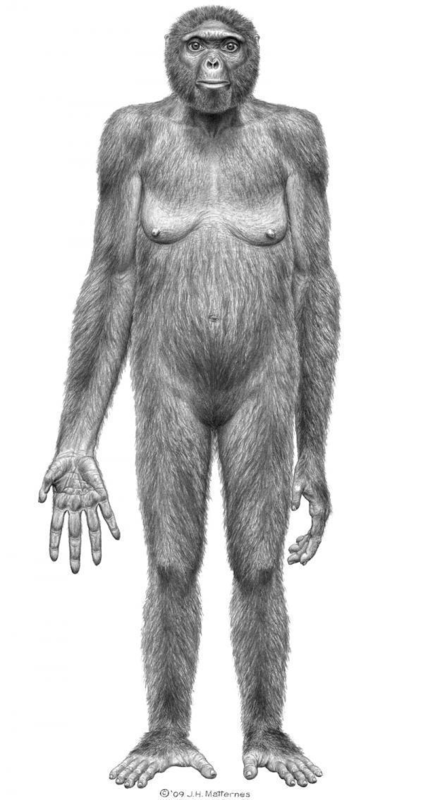 Probable life appearance in anterior view of Ardipithecus ramidus. The find for “Ardi” began in 1994, in the Middle Awash region of Ethiopia. Dated at 4.4 million years ago. Ardi further completes our understanding of human evolution. Such a fossil would certainly be picked apart by creationists with the “greatest” claim ever: “It’s just an ape.” Not an average ape, mind you. By bringing us closer to the 6,000,000 BC point in which humans-to-be and chimpanzees-to-be diverged, Ardipithecus revolutionised the way we think of our ancestry. It weakened the theory that protohumans were savannah apes that diverged from a quadrupedal ape. Instead, Ardi was a fully bipedal, woodland ape. 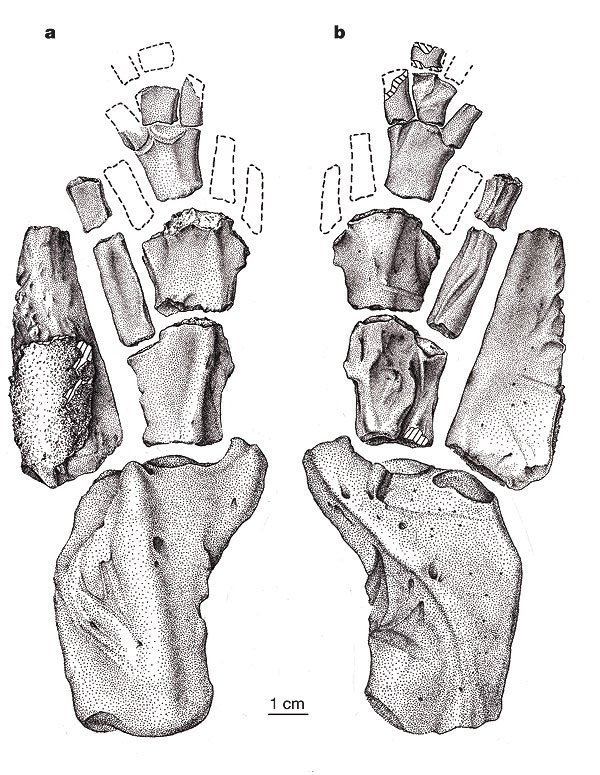 What Makes "Ardi" a Great Fossil? Ardi’s feet is quite intermediate between those of humans and those of chimps. Just like chimps, the toes are opposable, but they’re shorter. Plus, the feet aren’t flexible enough to from climbing trees and grasping veins, and they’re more human-like from that point of view. The fingers of Ardipithecus ramidus are long and dexterous, much like human’s. Its wrists are also more flexible than those of contemporary apes. Canines are used by apes as a sign of male superiority. In a monogamous society, male apes have large canines, and they’re used in conflict with other males when fighting over females. However, Ardipithecus ramidus fossils showed that males did not have large canines, and certainly not larger than those of females. This feature shows that our ancestors did not have much conflict between males and males, and is great evidence that our ape ancestors had more pair-bonding and parental investment than previously thought. Ardi’s pelvis, although crushed and needed to be reconstructed by advanced digital technology plus anatomy experts, it nevertheless points to the fact that Ardi’s pelvis are wider than quadrupedal chimps and narrower than bipedal Australopithecines aka intermediate. This is greater evidence that our ancestors became bipeds before geniuses (Ardi’s brain volume is estimated to be 300 and 350 cm3, which is about the size of a modern bonobo’s/female chimp’s brain, but smaller than Lucy's 400 to 550 cm3 brain). Archaeopteryx – arguably the most famous fossil ever. 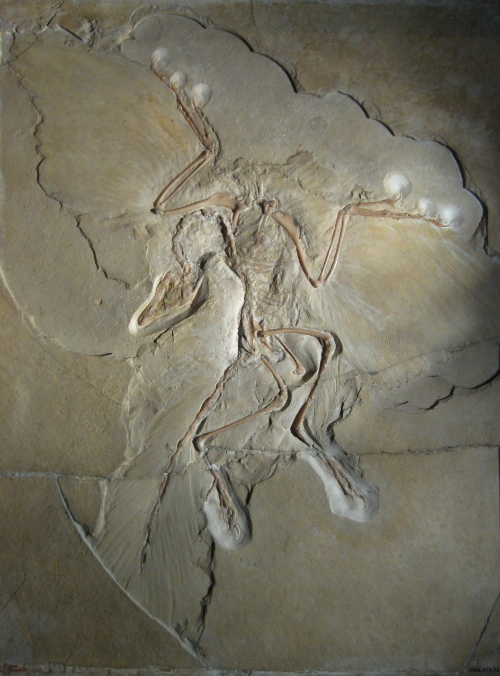 Found in a limestone quarry in Southern Germany in 1861, the bird is now widely recognised as the best example of the reptile-bird transition. And guess what, Bible Life Ministries call it a fraud. They claim that it is a dinosaur fossil with fake feathers, and thus shows how dishonest evolutionists are. OK, so the source came from In the Beginning: Compelling Evidence for Creation and the Flood, written by Dr. Walt Brown, who isn’t a scientist. Here’s the quote: “ Allegedly, thin layers of cement were spread on two fossils of a chicken-size dinosaur, called Compsognathus. Bird feathers were then imprinted into the wet cement ”. It’s on page 148. Unfortunately, the case doesn’t hold strong for Bible Life Ministries. Palaeontologists that examined the London Archaeopteryx arrived at a quite different conclusion - “Proof of authenticity is provided by exactly matching hairline cracks and dendrites on the feathered areas of the opposing slabs, which show the absence of the artificial cement layer into which modern feathers could have been pressed by a forger.” . This is featured here: Archaeopteryx is not a forgery..
One the most beautiful discoveries in the early 21st century would be Titaalik. Found in 2004 by Neil Shubin and his team in the Arctic Circle, it is now in the Hall of Fame as one of the most important fossils, well alongside Archaeopteryx and Australopithecus. Tiktaalik is the perfect example of the fish-tetrapod transition. Once again, Bible Life Ministries claim it is a fraud. Here’s their funny argument: “Since Archaeopteryx is a fraud (of course it’s not), therefore Tiktaalik is a fraud!” Don’t understand their logic? Me too. Unlike Piltdown Man, Archaeoraptor, and other frauds, Tiktaalik was certainly not found by “amateurs”, and the process of finding and excavating it is quite well documented. Bible Life Ministries, perhaps you would be kind enough to read “Your Inner Fish” by Neil Shubin? Yet in a twist, Bible Life Ministries suddenly change their mind and acknowledge that Tiktaalik is true, just not an intermediate - it is nothing more than another species of fish. Notwithstanding the confusion, let us show the poor (wilfully ignorant) creationists why is Tiktaalik so exciting, and how it contributes to a better understanding of evolution. What Features of Tiktaalik Make It a Fish-Tetrapod Intermediate? The operculum is a plate of bone that forms a flap that covers the gills in most bony fishes. The operculum’s primary function is to assist the fish in moving water across the gills. Losing the operculum allows the neck to move freely. All tetrapods don’t have the operculum, while primitives ones still retain the gill but have lost their operculum nevertheless. 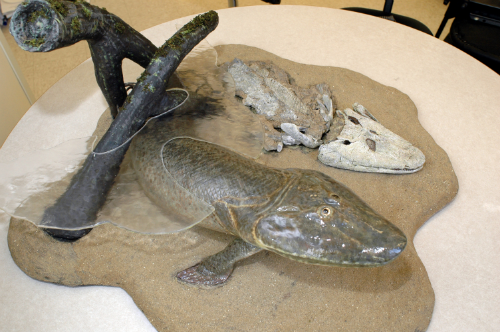 Tiktaalik lost its operculum but retained the gill, which is only expected from a fish-tetrapod intermediate. By losing the operculum, Tiktaalik was able to move its head independent of its body, and had a true neck. Also, without the operculum, Tiktaalik should’ve breath mainly using its mouth. The stapes is a piece of bone in our middle ear. It was originally a gill arch bone known as the hyomandibula. In Eusthenopteron, the hyomandibula large and boomerang like, in Acanthostega it's a small piece of bone, and in Tiktaalik it's exactly between. Comparison between the operculum and hyomandibula of fish and tetrapods. The main difference between fishes and tetrapods is the shape of their skull. Fishes have round, conical skulls with their eyes on the sides; tetrapods have flat skulls with their eyes on top. Tiktaalik has a flat skull, yet with some leftover characteristics from fish skulls. Dorsal view of Tiktaalik skull. Scale bar equals 5 cm. Fishes have fins, tetrapods have limbs. This is one of the main differences between them. To crawl on land, the fins are expected to evolve into limbs. And that’s what seen in Tiktaalik. The difference between fins and limbs lie mainly in their skeletal layout, The base of a typical fin contains 4 or more pieces of bones; limbs have a single bone known as the humerus that connects to the shoulder, which are connected to 2 forearm bones, then to pieces of bones, and finally to digits. So let’s take a look at Tiktaalik’s fin/limb. One can only awe at what a great finding it is indeed – to have found such a perfect intermediate between swimming fins and walking limbs. Read the description, and see for yourself. a, Dorsal view; b, ventral view. Elements with stipple shading were preserved in articulation in NUFV 109 and prepared in the round. Elements with a dashed outline are reconstructed based on their presence in the articulated distal fin of NUFV 110. It is not known how many radials lie distal to the first, second and fourth in the proximal series. Note the dorsal expansion of the distal articular facets on the ulnae and third distal radial/mesomere. 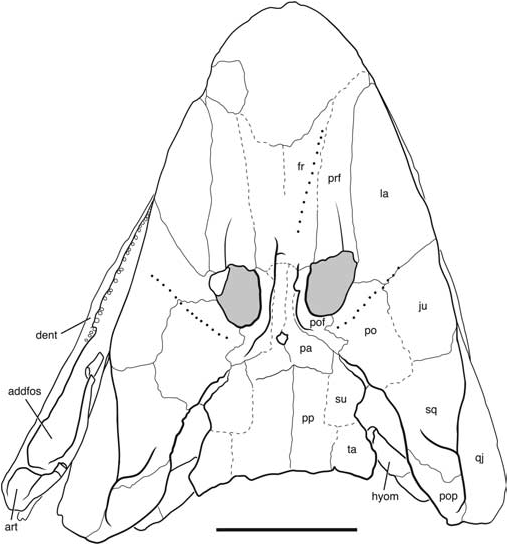 The dorsal expansion of these facets would have facilitated extension of the distal fin. Here’s a list of species which are obviously unrelated to transitional fossils, yet somehow included by Bible Life Ministries in their unfounded claims. Once thought extinct since 70 million years ago, the coelacanth was found in December, 1938 off the eastern coast of South Africa. Quite a startling discovery indeed, as it is such a great “living fossil”. That is, not counting the opportunity that the coelacanth provided for creationists to annoy us. So it basically boils down to the same old question: “Since the coelacanth has remained unchanged for 350 million years, evolution is false.” This assumption is so wrong on many levels. Firstly, this thought wrongly assumes that evolution is linear, continuously progressing towards humans as an end product. Instead, evolution is continuously branching, a process known as speciation. A fish can keep on evolving into a better fish while another fish may evolve to survive on the land. The coelacanth is one that stayed in water. It is also wrong to think that evolution is working towards a goal with an end product in mind. It is driven by the force of natural selection, that is the continuous interaction between individuals in a struggle to survive and reproduce. Our ancestors did not have a great plan to live on land, it was just natural instinct for survival that led them to venture out of water, perhaps to escape larger, predatory fishes. The coelacanth is a fish that managed to survive in its current form, and thus did not need to change. Lastly, the living coelacanths represents the genus Latimeria, not a species, and has changed from its ancestors. It is just that the changes were minor. I’m not very sure what exactly is Bible Life Ministries is trying to prove by using the platypus, but I’ll address it nevertheless.The platypus and the echidna are monotremes, the only mammals that lay eggs, and the platypus sure seems to have quite mix of mammalian and reptilian features (At least Bible Life Ministries is right on this one). What I find funny comes next. Bible Life Ministries then goes on to claim that the platypus has the characteristics of many creatures but is not a link to any of them. Duh!!! 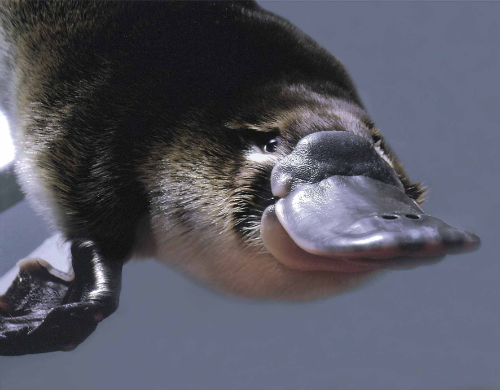 No one ever said that the platypus was a link to any species! Mammals diverged into 2 different branches about 140 million years ago, one of them which would later diverge into placentals and marsupials; the other branch consists of the monotremes. Get your facts straight. But what about the supposed “mix” of the characteristics in the platypus? Well the platypus is halfway between mammals and reptiles, so no surprise that it moves quite awkwardly. It lays eggs because it works, so no reason to change it. The males have poison as a result of sexual selection, and it doesn’t kill, just create great pain. Its famous bill is simply convergent evolution, and works quite differently from a duckbill. No problem for evolution whatsoever. 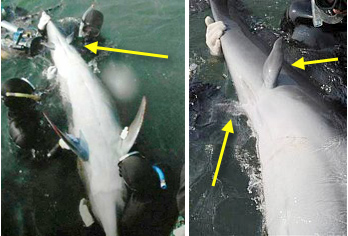 An atavistic dolphin was caught in November 2006. It seems here that Bible Life Ministries thought that we actually labelled the dolphin with rear flippers as evidence that dolphins evolved from dogs. Please, creationists, the article itself stated that it was a dog-like ancestor, not dogs. Sheesh. Moreover, Bible Life Ministries last sentence stated that the dolphin was just another odd species that “god” created. That shows their complete misunderstanding of what the fuss was all about. What we find fascinating here is not that we found a vestigial flipper. It is long known that cetaceans’ hind limbs are hidden within their body (See my previous post for more details). Instead, what we are dealing with here is an atavism, which is the appearance of a structure that was present it the individual’s ancestor, but not anymore in the present. In other words, it means that hind limbs of mammals were once present, but have since been reduced to pieces of bone in the dolphins body; this bottleneck dolphin however has hind limbs, and thus is a case of atavism. Another example is the growth of toes in atavistic horses. Atavisms are caused by a abnormal reading of genes, in which pseudogenes are accidently transcribed. It certainly looks as if Bible Life Ministries did not do any research on the transitional fossils listed. They're just repeating the mantra: "There're no transitional fossils... Just show me one, just one...". It it shown in this post that there are quite a large number of transitional fossils, despite the fact that this is just a tip of the iceberg. No more excuses, creationists. Face the fossil record. Bible Life Ministries 3rd claim focuses on missing evolutionary branches. However, this claim isn’t even an argument, but simply a gross misunderstanding of the Theory of Evolution. I’ll explain it in the next post. Daeschler, E.B. et al. 2006. A Devonian tetrapod-like fish and the evolution of the tetrapod body plan. Nature 440: 757-763. Charig et al, Archaeopteryx is not a forgery., Science, 1986, v.232, p.622-626.